When arranging coverage for a ship in the London market, insur- ance brokers will soon be able to conduct negotiations with under- writers over a computer. Already, dummy trials are being held, with live electronic placing scheduled to start in April. The Institute of London Under- writers (ILU), which is pressing its members to speed up the introduc- tion of electronic claims systems, wants to see all claims business com- puterized by the end of the year. When paperless underwriting systems were first contemplated, many brokers and insurers felt that electronic placement would not be suitable for marine risks because of their size and complexity. But that perception has changed, according to Charles Wilkins, data process- ing manager at the Institute of Lon- don Underwriters, which represents 101 marine and aviation insurers in the company market. London market. The London Net- work Management Committee is coordinating the project in which the Lloyd's Insurance Brokers Com- mittee, Lloyd's of London, the Insti- tute of London Underwriters, and the London Insurance and Reinsur- ance Market Association are par- ticipating. Lloyd's and the company market will all start testing elec- tronic placement systems together next month. The first phase will enable a bro- ker to prepare a risk package pro- posal on screen, to obtain quotes from underwriters, send a confir- mation of a firm order, and provide a facility for processing endorse- ments to a risk package held in the system. In the USA A/S Vesta is represented by 4 sister companies who will render full scale sales, service and technical support. Class: A Surface Combatant for the 21st Century; from Design to Con- struction, the Evolutionary Process." Highway, Bath, Maine 04530; tele- phone: (207) 443-1392. Marine Inspection Office/Captain of the Port to interact in a seminar type atmosphere. Several workshops have been or- ganized on barges, oceangoing ves- sels, Subchapter T boats, Captain of the Port topics, licensing and docu- mentation, etc. The cost to attend is $25. Shell and tube heat exchangers, elec- trical heaters, and a combination of both. All Vesta heaters are capable of exchanging heat be- tween a large variety of liquids. A/S Vesta heaters are built for all marine, power, and indus- trial applications up to 56 m2/400 kW. 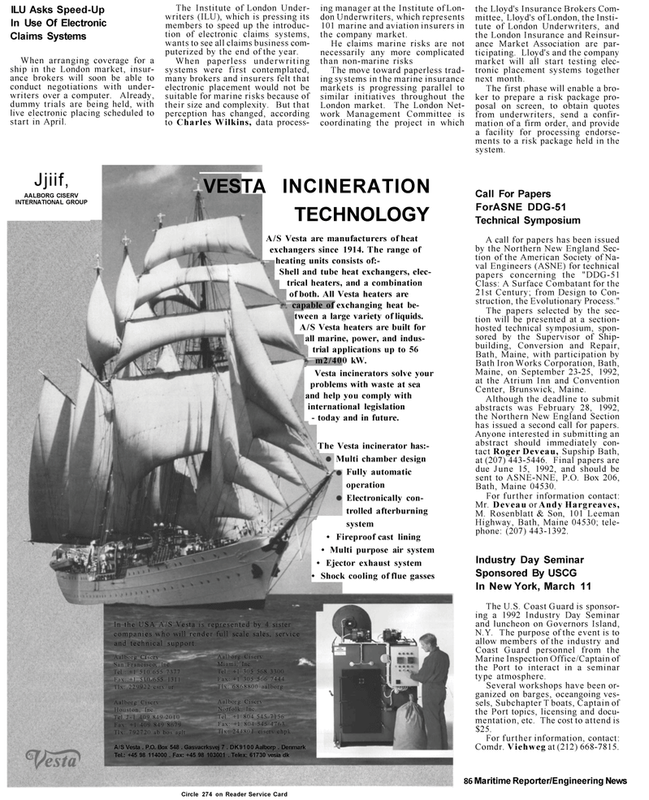 Vesta incinerators solve your problems with waste at sea and help you comply with international legislation - today and in future.